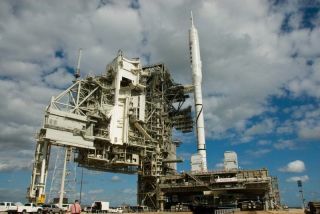 CAPE CANAVERAL, Fla. - The first test flight of NASA's newAres I rocket is on track for a Tuesday launch, but the weather may notcooperate, officials said today. The Ares I-X booster, an unmanned prototype of NASA'snext-generation Ares I rocket planned to carry humans to orbit, is slated to liftoff from Pad 39B at Kennedy Space Center here at 8 a.m. EDT (1200 GMT) onOct. 27. "I'm really happy to report that we aren't tracking anyproblems and the vehicle's in great shape," said Jeff Spaulding, launchtest director, during a Sunday briefing. "We're looking very good for Tuesday'slaunch." Mission managers' main concern at this point is the weather,they said - a gloomy 60 percent chance of cloudy skies is predicted. "Our weather on Tuesday is going to be a little bit ofa problem," said weather officer Kathy Winters. Because Ares I-X the first testlaunch of a new rocket, and the purpose of the flight is to gather detailedvisual and sensor data about how the booster performs, NASA requires pristineweather to launch. Winters said Ares I-X's weather requirements were morestringent than the conditions needed to launch the space shuttle. A major difference is the rocket's risk for triggering somethingcalled "tribo electrification." The phenomenon occurs when thebooster travels through clouds and stimulates static electricity that can causeinterference in onboard instruments. The shuttle has been proven immune to thisrisk. Ares I-X has a four-hour launch window on Tuesday - from 8a.m. to noon EDT (1200 to 1600 GMT) - during which the rocket needs only about10 minutes of clear skies to get off the ground. If launch is impossibleTuesday, NASA can try again during an identical four-hour window on Wednesday,when slightly better weather conditions are expected. "I feel more optimistic about Wednesday thanTuesday," Winters said. The full launch team spent Saturday running through acomplete countdown rehearsal. "That went really well yesterday afternoon,"Spaulding said. The $445million trial flight will use a real first stage (albeit with only foursolid-rocket segments, compared to the eventual five that are planned for AresI), with a mock second stage and crew capsule on top to simulate the size andweight of the planned rocket. Ares I-X stands 327 feet (100 meters) high,making it the tallest rocket currently in service. Tuesday's launch will mark a milestone for NASA's Constellationprogram, which includes Ares I and the Orion crew capsule planned to flyatop it. Yet the fate of Constellation is under review by President Obama, whois set to make a decision soon about the future of NASA and the goals he'd likeAmerica's human space program to pursue. Some experts doubt that Ares I will make the cut, given thatit was largely designed to serve as a space shuttle replacement to ferry humansto the International Space Station. With the space station set to bedecommissioned in 2015, and Ares I not likely to ready until around 2017, somewonder whether building the rocket is worth the expense. But whether or not plans for Ares I proceed, the upcomingtest flight will still be useful, mission managers said. "It's very significant data that is going to be veryinstructive to us since we haven?t done this in a long time," said DougCooke, associate administrator of NASA's Exploration Systems MissionDirectorate, on Friday. SPACE.com will provide full coverage of NASA's Ares I-Xtest flight with Staff Writer Clara Moskowitz in Cape Canaveral, Fla., andManaging Editor Tariq Malik in New York. Clickhere for full mission coverage.